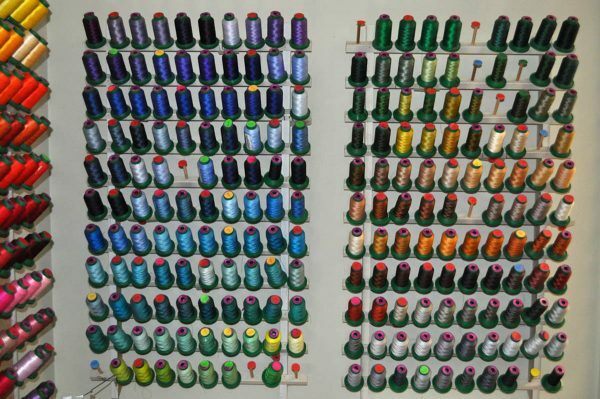 Do you organize your thread? This great organization tip from Nancy Prince comes in handy in your sewing room. Little did I know 17 years ago when I started thread painting that thread would become such a large part of my life. Needless to say thread is stashed in various locations throughout my studio. The majority of my thread is organized on thread racks by weight and color family. Keeping thread by weight and types minimizes not only pulling the wrong thread but also the wrong thread weight. 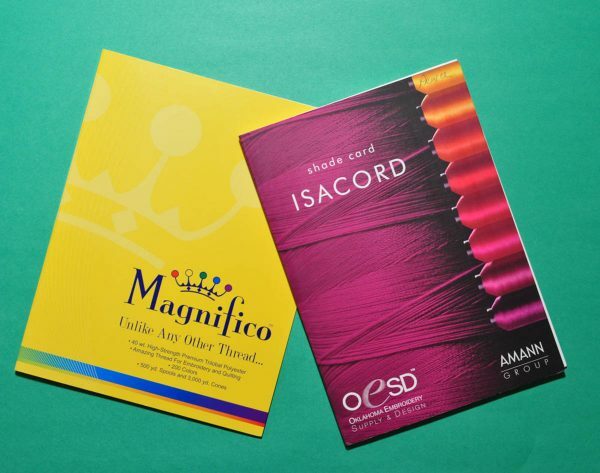 Thinner 60 and 100 weight threads are kept together by color, variegated threads are stored by color, then weight. At a glance over 700 spools are available on racks for immediate selection. The Art Bin Super Satchel is a great way to store threads too, because it takes up a minimum amount of space and with wheels attached, it can be moved about as needed. The large thread insert holds 36 of the large cones and can be stacked in a carrier 6 high. In order to assure each spool is returned to the proper spindle on its wooden rack, I write the color number of the thread on a colored dot (available at office supply stores) and stick it on the end of the wooden spindle when the thread is removed. When ready to change threads, the dot is removed from the wooden spindle and then it is stuck back on top of the thread which then goes back on the wooden spindle. This way each thread gets back onto the proper spindle. I have companion thread charts that correspond to each thread manufacturer on the rack. Another reason for writing the thread number on the dot is for those of us with less than perfect eyesight, well, we can actually read the thread number. Sometimes the numbers on the top or sides of the thread spool are so small that even with glasses it is difficult to see the numbers. Now I know you are saying this lady has thread on the brain, but trust me, in the long run you will know where each thread color is when you need it. 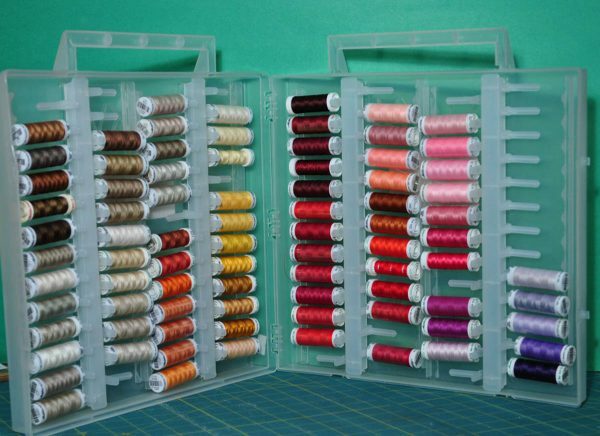 To help maintain the life of the thread keep thread racks out of sunny areas. To further increase the life of the thread cover racks with dark fabric to keep the sun and dust off. Nice system. Looks like a better way to stay organized than my random dumping of all threads into one basket. Any ideas for a rack system that doesn’t need to be purchased? I purchased a large piece of pegboard, framed the back with 1X2″s, and painted the whole thing white. Then I purchased wooden dowels, the size of the pegboard holes and cut them to the desired length and glued them into the pegboard holes at a slight upward angle. 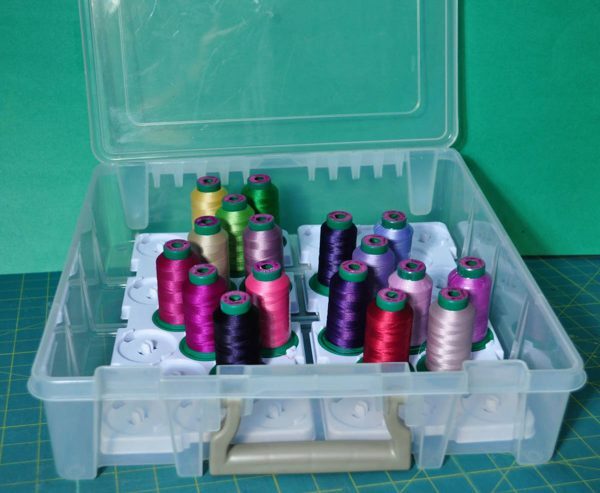 It not only works great for thread but also embroidery hoops, tape measures, bobbins and anything else that you want to find easily. I then purchased a few metal pegboard hooks for hanging my scissors and stabilizer. Wonderful idea!!! I have something similar but, it cost more and took a lot more time to put together.